Imagine yourself in a picturesque valley in Georgia’s Northeast Mountains at the beginning of the Applachian Trail. Imagine a unique view of the Little Tennessee River Valley of the Blue Ridge Mountains. 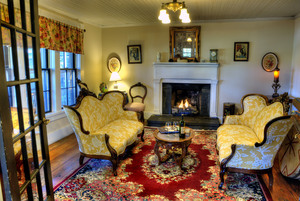 At the York House Inn, you can find this beauty and relaxation. The York Inn is Georgia's oldest Bed and Breakfast Inn since 1896, and is listed on the National Register of Historic Places. 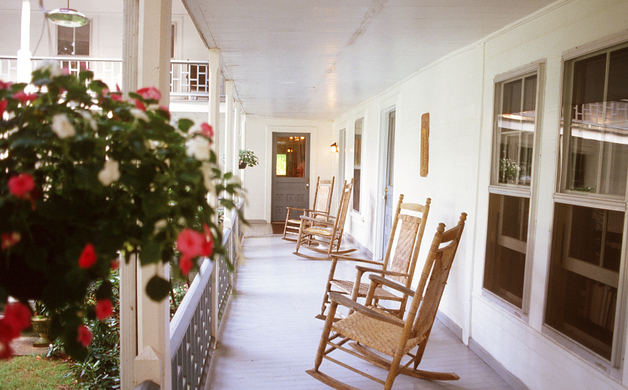 Originally described as a “large ideal country home”, the Inn has long been known for mountain spring water, and large verandas with views of the Little Tennessee River Valley. 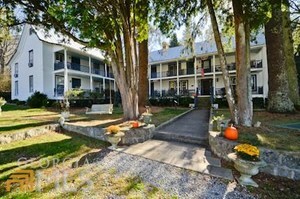 The inn has been providing for guest comfort for longer than any Inn in Georgia. 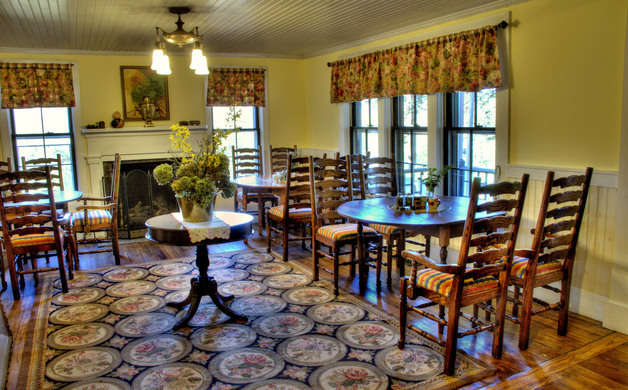 The beautifully landscaped 4.5 acre property is listed in many guidebooks and offers some of the best of Rabun County lodging. The York House was once famous for free access to “grape, plum and apple orchard” as well as our “farm run in connection with the house” – so they try to feature the freshest of everything. The York House is Georgia's oldest Inn, listed on the National Register of Historic places. In the Rabun County area after the Civil War, farming was the industry of the county with only a grist mill and some scattered sawmills. Hiram Gibson deeded 40 of his 1,077 (175 improved as of 1880) acres near the Little Tennessee River to his granddaughter, Mollie, “Little Mama” (Mollie Gibson York) in 1873. She and her Civil War veteran husband William T. York, “Papa Bill,” eventually grew the farm to approximately 400 acres. The Inn began operating in 1896 in the two-story farmhouse, with the York’s living in the slave quarters in the basement. The addition to the original structure was completed in 1907. As late as 1981, original wiring from a Delco system of 1907 were still in use. It appears that the Inn maintained as many as twenty six rooms in the early 1970’s, several most with private or connecting bathrooms. In the early 1970’s were $44.85 a week for two or $7.85 by the day. The farmhouse itself dates to 1846 and was constructed from Chestnut logs, then covered with pine plank siding. The logs are unique, as American Chestnut trees were killed off in a blight in the 1920s. Chestnut beams and the original dove-tailed log construction can be viewed in the gifts area and in the former slaves quarters, now refurbished, on the lower level. In this area of Georgia, farming was the primary goal, with the York farm producing barley, corn and rye. The York House continued passing from mother to daughter until 1979, until the York Family owner, Bea York Weatherly Broadrick, passed away in 2014 at the age of 98. Originally the Inn was purpose built to house workers for the railroad and then catering to travelers or boarders on the Tallulah Falls Railroad. The Charter for the Georgia Corporation was granted in 1838, but wrangling over the railroad route caused construction delays until the 1850s. Construction started in 1854. All of the work on the railroad project was stopped with the outbreak of the Civil War. The failure of the Blue Ridge Railroad employing what was estimated as 2000 people before the War, resulted in adverse social and economic conditions the area. After the war, efforts to resurrect the Blue Ridge Railroad failed. The railroad that did come to Rabun County was the Tallulah Falls Railroad, which ran from Cornelia to Franklin, NC. Construction on the Tallulah Falls project, originally referred to as the Northeastern Railroad, began in 1871. The goal was to build a railroad connecting Athens to the planned Blue Ridge Railroad, using the right-of-way through Clayton. By 1895 the immediate property had as many as eight additional structures: a spring house, smoke house, dance pavilion, wagon shed, pig pens, log cabin, corn crib and stables. The spring house is the only structure remaining, several were destroyed to construct the house next door and the smoke house and log cabin were relocated and reconstructed at nearby Foxfire center. The York House Inn was added to the National Register of Historic Places in 1982. The Inn was accepted to the Register for its evolution from log cabin to Victorian Inn, landscape architecture making use of the aesthetic features and natural setting, it’s significant association with railroad commerce and finally due to the Gibson and York family significance in local politics. The York House design reflects similar hotels of the day, however most examples of the “Resort Era” were located in town square areas and not rural adaptations. Most are long gone. The landscaping and building orientation and well known two story porch make for excellent views of the Little Tennessee River Valley. Railroads have long been a part of Rabun County history, and therefore, that of the York House as well. The York House and its long gone dance pavilion were a community gathering place. The Gibson and York family members were active in local politics, Hiram Gibson being Sheriff of Rabun County and William York being Sheriff of the City of Clayton. Many of the York women were colorful local personalities. The Inn has hosted famous guests, including Walt Disney and Joel Chandler Harris. Also, scenes from the film the Great Locomotive Chase (1956) has been filmed here. To learn more about the beauty of the York House Inn, as well as how to book a room, you can visit their website. Content courtesy of Stan and Christine Penton, Owners and Innkeepers of the York House Inn.